I started to write a blog post about my backup solution, but didn’t actually finish it before this happened. I only got it running on Wednesday this week, when today my laptop (running Ubuntu 9.04) refused to boot! I was getting a lot of I/O and “DRDY ERR” error messages. The boot process mounted the drive read only, dropped me to a shell and told me to run fsck manually (not terribly helpful for inexperienced users I might add). 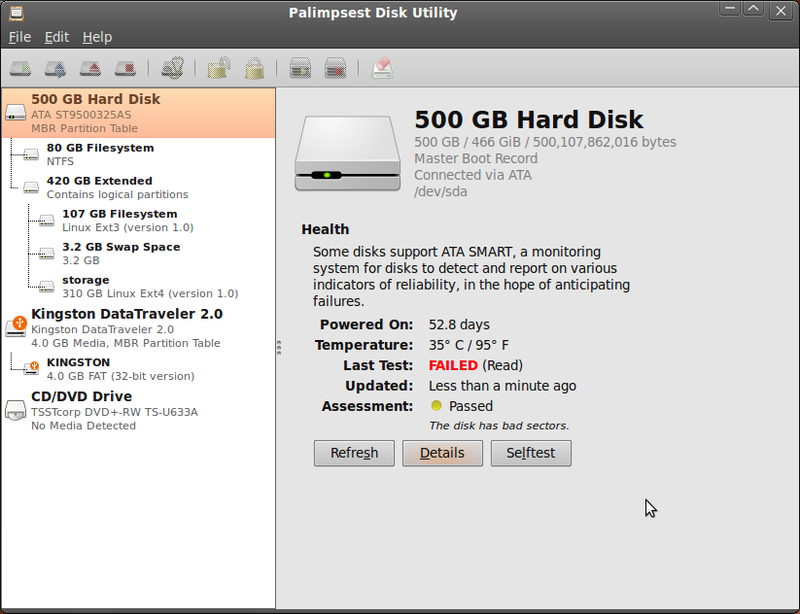 Bad sectors are not a good sign, so it would seem that this not-very-old 500gb hard drive is on the way out. To “repair” the bad sectors (i.e. make sure the filesystem doesn’t use them), I ran “fsck -c /dev/sda5” (sda5 is my root partition, the one that was giving me trouble). This runs the filesystem check in conjunction with the badblocks tools. For now it’s up and running again, but I’ll be replacing the drive and restoring my data before sending it off for RMA! It looks like I won’t need to go back to a backup, but this certainly shows the value of regular backups and when my laptop failed to boot I was extremely glad I had them! Ubuntu 9.10 beta is only a week away, and so far “Karmic Koala” is shaping up to be a solid release. This entry was posted in IT, Linux and tagged hdd, karmic, ubuntu on September 25, 2009 by Alex. So it’s Saturday night and… I’m blogging about Karmic Koala. My social life has really taken off recently. But on a more serious note I took alpha 6 for a spin on my E4300, and so far I’m impressed. I haven’t actually installed it to the hard drive yet, just booted from a USB key. But everything’s working well so far, and kernel mode setting is just the bees knees. It’s amazing how much of a difference it makes when switching terminals – it’s instantaneous. You will definitely want to be running an Intel or ATI card for this version. I’ll be upgrading permanently once the beta comes out, so I’ll go into more detail then. I’ll also be refreshing my Mythbuntu media PC (Athlon II 250, Geforce 8200 motherboard), older laptop (HP nx6120), and maybe my old desktop (Intel P35 + ATI 4850), which gives a pretty broad coverage in terms of hardware testing. I’m looking forward to seeing if battery life has improved, as when Vista gets 5 hours and Ubuntu just over 3, you know something’s wrong. It will also be nice to have an up to date browser again – Firefox 3.5 under Jaunty is not well integrated. Can’t comment on the boot speed as my flash drive is rather slow (and the live distro is not really indicative anyway). I tried to have a go with the new gnome-shell too, but unfortunately couldn’t get it to load. All I did was aptitude install gnome-shell from the live usb distro, so hopefully I’ll be able to get it working after installing the beta. Decided it’s time to finally wipe Windows too, I never boot to it so it’s just a waste of 80gb. Believe it or not, this will actually be the first time I’ve not had Windows installed on my main computer, so quite a milestone really. It’s been over 3 years since I switched to using Ubuntu as my main OS, and looking back at Ubuntu 3 years ago it has come a long way. Edgy Eft (6.10) was usuable but rough (wireless networking was huge pain), and 7.04 was a big improvement. 7.10 was one of those high points, and was when I first started seriously recommending Ubuntu to others as a replacement for Windows. Then 8.04 with pulseaudio was a bit of a mixed bag but otherwise pretty solid, and 8.10 was a rather unexciting steady improvement. 9.04 was a big step forward with much faster boot times but big problems with the Intel graphics driver. 9.10 looks to resolve most of the Intel graphics regressions but I think we’ll find there will be room for 10.04 to improve again. That’s one of the things I like about following Ubuntu – we get new toys to play with twice a year. This entry was posted in IT, Linux and tagged karmic, ubuntu on September 20, 2009 by Alex.